US, 1985, 95 minutes, Colour. 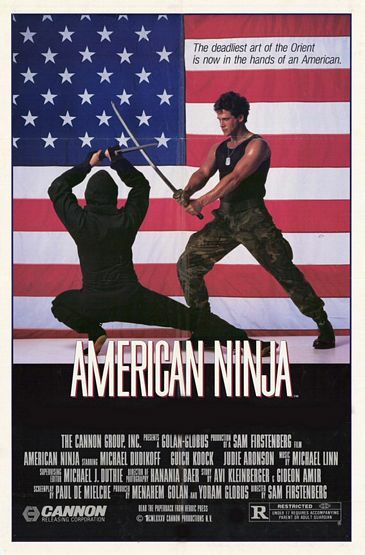 American Ninja is a Canon Films production focusing on American patriotism and the popularity of martial arts actioners in the '80s. It is in the Rambo vein. It focuses on a martial arts champion, trained in Ninja techniques, who is able to combat a Latin- American conspiracy and the contacts in the American forces plotting with the Latin- Americans. To this extent, the film is topical because of American antagonism towards Nicaragua in the early '80s. However, the film is comic strip style with plenty of action and a strong if taciturnly stolid hero. The film is one of a series of Ninja films which include Enter the Ninja, Return of the Ninja, Revenge of the Ninja, the latter being directed by Sam Firstenberg. 1. Action entertainment? Martial arts? American patriotism? 2. Latin- American setting? Military base? Latin- American affluence? The special effects? The stunt work for the fights? Explosions? Musical score? 3. The title and the focus on the traditional Japanese martial arts? The Japanese Ninja and their being used for political purposes? The American jingoism with an American Ninja? 4. The hero and his stolid style, lack of background, his memories, the training as a Ninja after the death of his parents? His record and his being in institutions? Military? His thwarting the ambush? His skill in the martial arts? Rescuing the Colonel's daughter? Antagonism of the Colonel and the Sergeant and the irony of their being in the plot? His being put in the brig? Escape? His driving the truck, in the warehouse, combating the Ninja? One against many and his success? The resolution of all the problems? Happy ending? The '80s American hero, Rambo style? 5. The colonel's daughter, her wilfulness, her being rescued, her antagonism, friendliness, danger? 6. The Colonel and the Sergeant, their hostility towards the hero, the military plan, the armaments? The contacts with the wealthy businessman? 7. The businessman villain, his villa, guards, contacts, shipment of arms? Employing the Ninja? 8. The Ninja and their skills, the private army, ambushes, the warehouse fights, being defeated by the hero? His mentor being the gardener and his supporting him, the pathos of his death? 9. The popularity of this kind of slam-bang action in the '80s? American values? Pride? Martial arts? Violence on the screen? Comic strip style conflicts of good and evil?